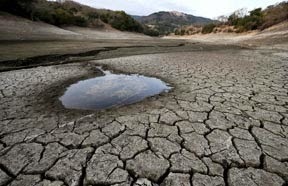 If you've been paying attention, then you've seen the headlines regarding the worst drought in California in 500 years. It doesn't take a crystal ball to predict that this will have a severe impact on the food supply in this nation. Since California produces approximately 3/4 of all vegetables, nuts and fruits grown in the US, you can imagine that many products will be either extremely expensive, or even unavailable. We can expect to see a shortage of many food items that we take for granted: celery, olives, apricots, lettuce, tomatoes, plums, prunes, figs, cantaloupe, strawberries and spinach. And let's not forget what the California drought will do to the vineyards and the wine industry. And did you know that California is the largest producer of dairy in our nation, with 1.75 million dairy cows? The lack of water will devastate these industries and most certainly effect the cost of food, as well as the supply, in our own country and the world for years to come. But it's not only crops that are feeling the lack of water -- you may have seen the scattered reporting of hundreds of California residents waiting in extremely long lines for hours, just to get a gallon or two of drinking water. When the situation is that bad, we better sit up and take notice. But it is not only California that is feeling the effects of drought. Parts of Texas and Oklahoma are feeling the drought as if they were reliving the Dust Bowl era during the 1930s. All of this is taking a toll on the nation's agriculture and economy. And, I'm sure it won't surprise you to know that we can expect the government to step in and try to regulate water sources on private property and control the consumption of water. Like the Gold Rush in our past history, there is now a rush to buy up water rights ... which makes the purchase of the following book all that more important. 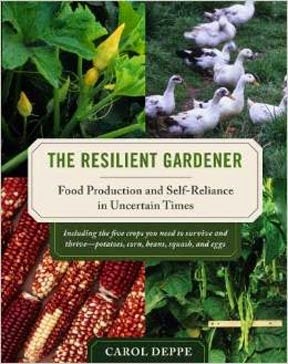 The Resilient Gardener: Food Production and Self-Reliance In Uncertain Times is a must-have for your resource library. The author, Scientist/gardener Carol Deppe, offers a book beyond your garden-variety cookbook (sorry for the pun! ), and offers principles regarding sustainable agriculture, health, nutrition, along with detailed information about growing and using five key crops: potatoes, corn, beans, squash, and eggs. • Garden in an era of unpredictable weather and climate change. • Make whole-grain, corn-based breads and cakes using the author’s original gluten-free recipes involving no other grains, artificial binders, or dairy products. • Keep a home laying flock of ducks or chickens; integrate them with your gardening, and grow most of their feed. The marketing for this book describes it's impact this way: "Resilience here is broadly conceived and encompasses a full range of problems, from personal hard times such as injuries, family crises, financial problems, health problems, and special dietary needs (gluten intolerance, food allergies, carbohydrate sensitivity, and a need for weight control) to serious regional and global disasters and climate change. It is a supremely optimistic as well as realistic book about how resilient gardeners and their vegetable gardens can flourish even in challenging times and help their communities to survive and thrive through everything that comes their way." Sounds like it is a gardening book written specifically for these times. Some of the critics of the book have noted that it is written with a bent towards homesteading, sustainable living, and basic nutrition. But if times continue to get tougher, this is exactly the book you will want. Remember, when faced with difficult times, one of the keys to survival will be your resiliency ... your ability to be strong, flexible, hardy, and able to withstand or recover quickly from difficult conditions. The Resilient Gardener helps you grow the crops that will provide the calories you need to stay alive. DISCLAIMER: Don't think that everything she writes will pertain to you, or your climate, or your growing conditions. The author lives in the Pacific Northwest, and what works for her, may not work for you. You should buy this book for the tips and techniques, and use it to create a blue print for your own self reliant food system. It's time to get creative, use your brain, and get out ahead of the curve on your food supply. Don't wait until you're in panic mode due to the extended drought, unexpected weather conditions in your area, or social upheaval. Prepare now! Ezekiel 4:17 "I will do this that they may lack bread and water, and look at one another in dismay, and rot away because of their punishment."